These dates squares are a healthier take on traditional dates squares. These are a guaranteed holiday hit and if you thought date squares were boing and usually left behind on the dessert tray, these ones are sure to change your mind. Soak the pitted dates in hot water for 15 minutes. The water should be as hot as possible but no need to boil it. While those are soaking, prepare the crust and topping layers. Make the oat flour by blending 1 1/2 cups of oats. Let them processor for a while until they ressemble a very fine flour. Add all the crust ingredients to a bowl, including the oat flour, and mix it up. Press about 2 1/2 cups of the mixture into the bottom of a small, square baking pan that’s either been sprayed with non-stick cooking spray or lightly greased with coconut or olive oil. Drain the dates and then use your hands to mash them into a paste. This is a bit messy so if you prefer, you can blend them. I didn’t want to create a dirty blender cup so I just used my hands. Evenly spread the date paste over the crust layer in the pan. Press the rest of the crumble on top of the date layer. Bake for 40 minutes then let them cool completely in the pan. You can put them in the fridge to speed up the process. This is an important step for best results! I know it’s hard to wait but if you slice them too early they’ll be a bit crumbly…still entirely delicious but just a little crumbly. Once they cool they’ll be completely firm and hold together in squares. That’s it! Once they’re cool, server right away or store in the fridge or freezer in a container. Almond Flour Variation: Follow the same instructions for the dates and crust, except no need to blend oat flour. Make sure you let them cool in the pan before slicing. 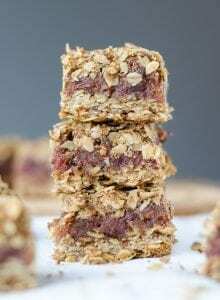 Make these changes: Use 2 1/2 cups (250 g) oats, 1 1/4 cup (125 g) almond flour instead of oat flour, 1/2 cup (130 g) maple syrup, 1/2 cup melted (80 g) coconut oil.